The YSI Services group can send trained engineers to your location and complete flow analysis of your river, stream, canal, culvert, or channel and provide you with a complete set of flow data. Utilizing SonTek's FlowTracker or River Surveyor, the Services Group can get you the flow data that you need to make sound decisions. SonTek, a Xylem brand, manufactures a variety of water velocity measurement instruments and is an industry leader in Acoustic Doppler Profilers (ADP's) and Acoustic Doppler Velocimeters (ADV's). The YSI Services Team provides complete installation, setup and indexing of these instruments ensuring that the manufacture's recommendations are met. With accurate channel geometry inputted into the instrument and proper velocity indexing determined, you can expect accurate flow data. Our Services group can perform routine validation of this data and additional velocity indexing if needed on a periodic or as needed basis. The Integrated Systems and Services team of engineers, field technicians and hydrologists can provide a complete measurement system for you flow measurement needs. Each application can have specific mounting and access challenges; our service team provides complete mounting solutions. The velocity indexing field service is also strongly recommended in applications where accuracy is critical and considerable variations in velocity and water level are present. Have questions about Flow Monitoring Services? Network of (20) river adjacent, solar-powered stations with telemetry to monitor stream water quality, flow, and pollutant loading information throughout the City’s watershed. Data analysis and reporting to Florida State Department of Environmental Protection for compliance with State regulations. YSI designed, constructed, and integrated all stations and is under current contract to provide site maintenance, instrumentation calibrations and data collection for the entire network. 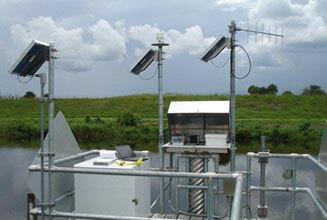 YSI additionally provided all instrumentation including multiparameter sondes, Sontek acoustic Doppler flowmeters, SDI-12 shaft encoders for redundant stage measurement, ISCO transportable refrigerated automatic water samplers and RTUs programmed to transmit data to base station with real-time graphical illustration of data on public URL.